If you're looking for an incredible view and a cozy rental, the search ends here! 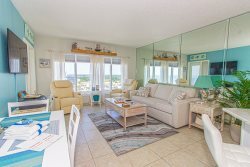 This top-floor studio sits atop the 23rd floor of the Palace Resort in Myrtle Beach, SC and offers endless views of the Atlantic Ocean & Grand Strand. Our guests love watching dolphins and sunsets from the balcony! This unit comfortably sleeps 2 with one queen bed. Feel free to pack light as this rental is equipped with all necessary supplies such as toiletries, linens, pillows, quilts, towels, dishes, cookware, utensils, silverware, coffee pot, toaster and more! This is a small studio with approximately 450 square feet of living space; a perfect beach getaway for 2. Other features include a full kitchen, full-size fridge, microwave, stove, flat screen TV, plentiful cabinet space, small dining table and chairs, closet space, private balcony, and private bathroom. Please note: The Palace Resort is currently completing an exterior project that will take place until the end of April 2019. Our balcony is complete and you will have access to it. However, because other balconies are being worked on, there could be noise and odors that affect your stay. Pools and amenities may also be affected. If given advance notice, we may be able to give you pool access to another place. We apologize for any inconvenience but because you are being forewarned, there will be no refunds given. Our prices are already marked low due to this. Water Features: There are 2 oceanfront outdoor pools! One of the outdoor pools becomes indoor in a small area (see picture). There are indoor and outdoor hot tubs! You will receive 4 pool bands that need to be left in the room for your departure because we reuse the passes. If they are not left, this may result in extra charges. Guest Laundry Facilities: There is a laundry facility (coin machine operated) on the 5th floor that you are free to use. Amazing view!! The room was cute and loved the furniture. Check in/out was super easy, price was fair & location was awesome. We will definitely be returning!